John Harper lived in Singapore from 1957 to 1959. 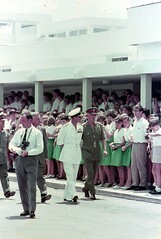 Like many of the children of British military personnel who were stationed in Singapore the 1950’s and 60’s, John had fond memories of Singapore. In fact, he wanted to preserve his memories in a book. When John saw my request for stories of the childhood of British kids who grew up in Singapore, he generously agreed to share his notes with us. I am sure you will enjoy, as I did, reading the memoirs of John Harper, and marvel at his fantastic memory. Once again, thank you John, for sharing your story with us. At last leaving day arrived. The two old ladies across the road came over to say goodbye and gave us a large bar of chocolate for the journey. We felt a little bit guilty as we had always called them the "mad ladies" because they had complained when we had lost balls in their garden. Many of the neighbours came to say goodbye and we were pleasantly surprised to see how many people had turned out just to say goodbye to us. We went to one of the Blackpool stations (I think it was the central one) and got on a train and eventually ended up in London where we were then taken by bus to the Union Jack club for an overnight stay. Next day after lunch we were taken to Waterloo station and put on a boat train to Southampton. We shared the train compartment with a Glaswegian family and although it was difficult to understand what they were saying at first, my ears tuned in after a while and life stories were swapped. As the train arrived my mother got me to put a Macintosh over my arm to hide the plaster, as she wasn't sure whether we would be allowed to travel if anyone spotted it. To make doubly sure my brothers and the Glaswegian family we were sharing the train carriage with surrounded me to further hide the arm. Before us was what looked to me like a magnificent liner, the S.S. Dilwara of the B+I line. I had never been this close to such a large ship before. (You can see a photo of the S.S. Dilwara here) Trawlers in Fleetwood harbour and steamers on Lake Windermere had been the largest things that I had seen. After our documentation had been checked, we all trooped up the gangway with all the children still crowding round me to hide the arm in plaster. Once on board I was confined to the cabin until we had set sail and were well away from the port before I was allowed out of the cabin. The plaster cast was by now only loosely covering my arm which had shrunk with sweating and the muscles wasting away. When the M.O. got the snippers out to remove it, I told him there was no need and just slipped the cast off over my fingers. The arm was duly X rayed to confirm that the break had healed OK. Despite the healed bone, the M.O. said that he was not going to take a chance with a young lad traveling on a ship getting into mischief and re-breaking the arm. One of the biggest disappointments of lie was to have a new cast put on and then it was back into the ambulance and back to Port Louis and the ship. 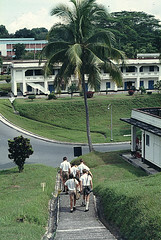 Arrangements were then made for the removal of the cast when we arrived in at RAF Changi in Singapore. 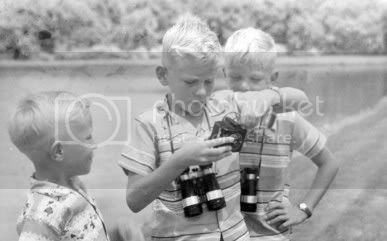 In the meantime all the other children had been taken off to a beach somewhere for the day. 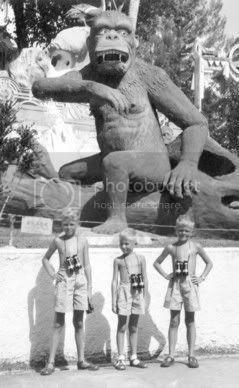 For many years I felt jealous of my brothers Bob and Tom that they had been taken to a beach somewhere. I only found out a couple of months ago that the person who was looking after them whilst my mother and I went to have the plaster cast seen to, made them sit under the trees in the shade and wouldn't allow them to go anywhere near the water. Jealous feelings immediately extinguished. I probably had just as interesting a time of it as they had, even if was only looking at mile after mile of sugar cane. 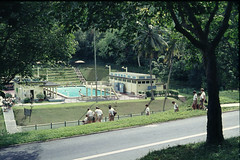 I saw your request for childhood memories on Memories of Singapore and have posted one comment about kampongs on your blog. 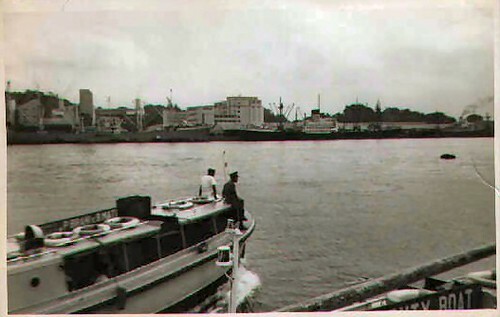 My father was army, but in the water transport as a navigator on the landing crafts. 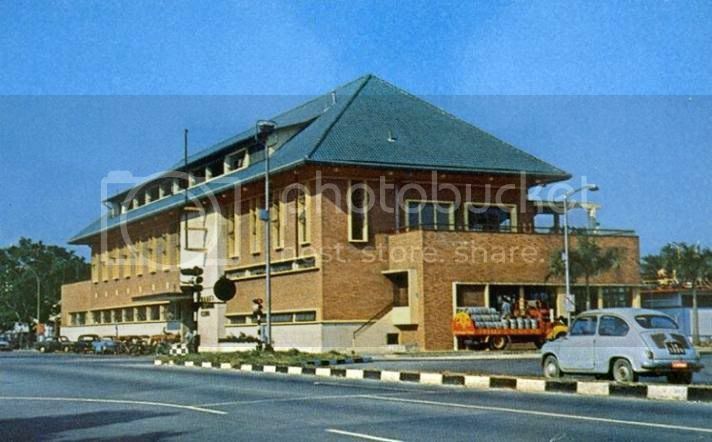 I lived on the small island of Pulau Brani and went to the army primary school from 1958-1961 and then lived there again from 1963-1966, when I went to Alexandra Grammar School at Gillman Barracks and St Johns Comprehensive in Dover Road. 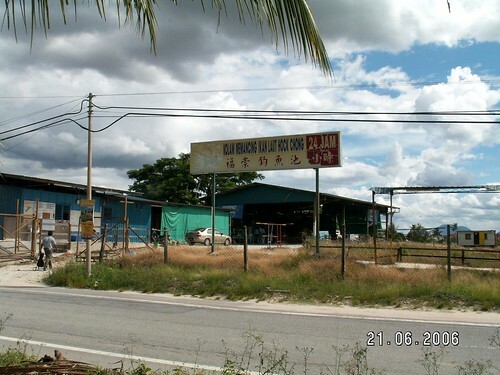 Any items on Pulau Brani on the internet do not mention the army school, , nor the fact that the British lived there for about 50 years - only the two local schools - as if we never existed. Alexandra Grammar School and Alexandra Secondary Modern School were both at Gillman, and in 1964 the older pupils moved into the brand new buildings of St Johns Comprehensive School in Dover Road (now the United World College), with the first and second year secondary pupils staying behind in the old Alexandra Grammar building which was renamed Bourne School. At first only 1st and 2nd years stayed in the old buildings, but I believe that the following year it was changed to 1st, 2nd and 3rd years, but someone who went to Bourne would have to confirm that. All I remember is that my brother and I went into the 3rd and 4th years in the new school, by ferry and then bus from Jardine Steps. I have started collecting a lot of photographs of Pulau Brani, so if any of your readers have any, I would be most interested. It was a wonderful place to have a childhood, and I have many fond memories of it. By the way, some of my photos are on display in the Singapore Naval Museum. 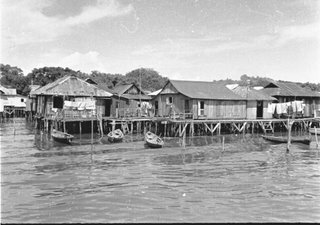 My amah lived at Kampong Saga (I think it was called) in a house on stilts. I believe that they were relocated to Tanjong Belayer. Is there any way that I could perhaps find out where she moved to? We called her Taliap, but I have an old wedding photo of her, with a Chinese name on it. From memory, I think that it was Sim Geck Siam; but I would have to look for it and check. I read your articles on kerosene lamps and elections. I remember that we had a visiting night market, (weekly/monthly ??) and the smell of a kerosene lamp takes me right back to those days. I can also remember the campaigning for the elections, with speakers and posters, but can't remember when that was. So many memories, I have lots more. By the way, (like Chun See), one of my favourite authors is Neville Shute, and A Town like Alice my favourite story, (and film - the original black and white version). Requiem for a Wren (one of Chun See’s favourites) mentions my home town of Ellon (about page 18 or thereabouts) !!!! Question: What type of bread does not go mouldy? Answer: The 70’s pop group Bread of course! Yes, yes, I know it’s a pretty lame joke. But then this time the joke is from my kids, the very ones who groan every time I tell a Lame Joke. Are you surprised that teenagers in 2006 listen to Bread? Well, it’s a tradition for us. 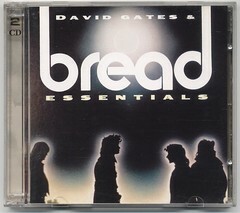 Every time we drive up to Malaysia we must listen to my Bread Essentials CD in the car. So it was no different this past week when we made another trip to Ipoh. 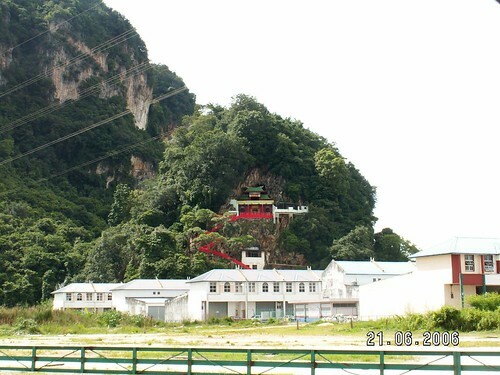 Some of you know that I make a trip to Ipoh every December with my family to visit my in-laws. This time, it was unplanned as we wanted to see my mother-in-law who had a fall recently. Thank God it was not serious. Nevertheless, it was a good break for all of us. 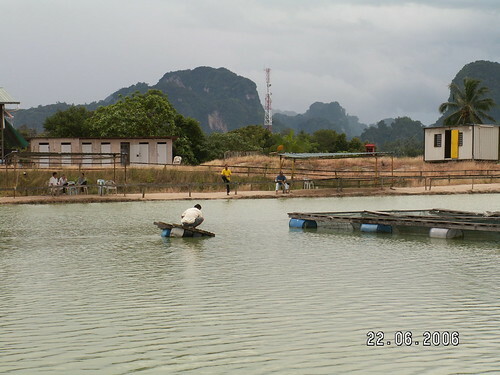 One afternoon, while my girls went shopping, I went fishing with my son to this pond near Tanjung Rambutan, about 10 km from Ipoh. 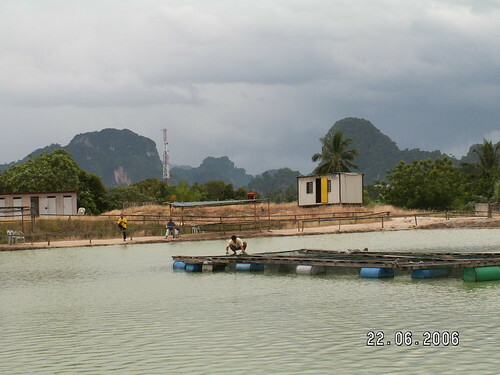 It was one of those ‘special’ ponds with salt-water fish; and at RM20 per hour per rod, it was quite exorbitant by Malaysian standards. We could see that most of the other anglers were seasoned regulars with expensive gear and reeled in their huge catches (sorry don’t know the name) which put up fierce fights, with practised ease. Most of them were Malays. On our part, we managed to hook 8 kois. Yes; kois - apparently, the owner had discarded them into the pond some time ago. 1. As ‘amateurs’ we were thrilled to be able to catch 8 huge (by our standards) kois. If only we could bring them back to Singapore. In fact, if one of the big fishes were to bite, we neither have the skill nor the equipment to reel it in. 2. We were from Singapore, not Ipoh. The S$28 we spent for an afternoon of quality time and father-son bonding was well worth it, not to mention the many nice photos that I took for this blog. I share them with you here. 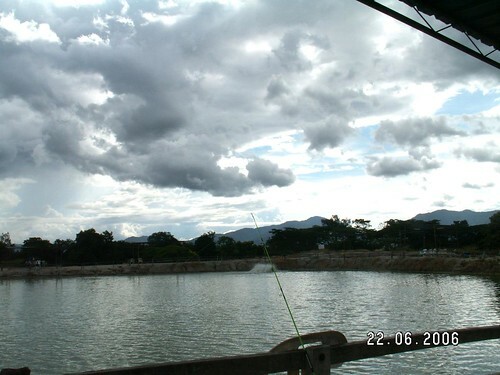 (2) No doubt, my blogofriend Francis Ho of Kuching Kayaking will like this picture of the clouds. See? 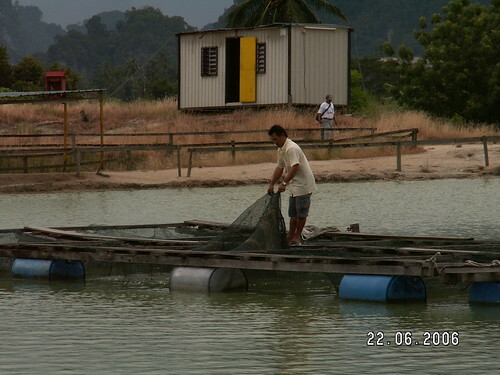 Not only Sarawak has nice clouds and mountains OK.
(3) Do you know what this chap is doing? 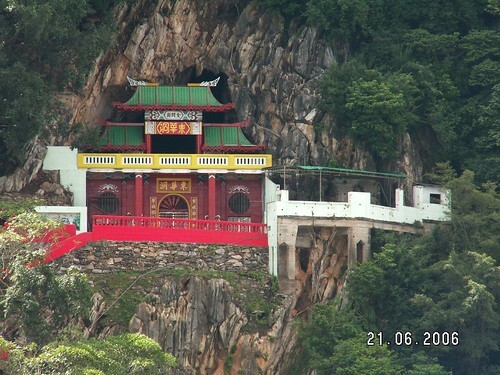 (5) On the way to Tanjung Rambutan, we saw this Chinese temple located at the mouth of a cave on the side of a limestone hill. Does it remind you of a scene from a Chinese kungfu movie? One other thing to share with you guys before I sign off. When friends learn that I drove a Toyota Wish, they often ask me about the mileage. They have heard that this car was very energy-efficient. Being rather ignorant and uninterested in such things, I have never been able to give an answer. So this trip, I decided to check. On my trip back from Ipoh to Singapore, I topped up the petrol tank at the outskirts of Ipoh. When I reached the Gelang Patah rest point near the Malaysian Immigration Check Point, we had traveled 534 km and used up slightly more than ¾ tank. The mileage meter read: 15.5 km/litre. The Toyota Wish is truly an amazing car. When I bought it about 3 years ago from a parallel importer, there were very few such cars on the road. I was quite concerned about the difficulty of getting spare parts. But today, I see so many Toyota Wishes on the roads of Singapore, even though there are hardly any reviews or advertisements in the papers. Footnote: For foreign friends reading this blog; Ipoh is the capital city of Perak, one of the northern states of Peninsular Malaysia. It is linked to the western end of Singapore by what is called the North-South Highway; or PLUS in Malay, Projek Lebuhraya Utara Selatan. Traveling time for the approx 600 km journey is 7- 8 hours including rest breaks, and depending on traffic and immigration/customs clearance etc. My friend Victor recently blogged about the British Legacy in Singapore . Coincidentally, I also came across a group of British folks who are a part of that legacy. Fondly calling themselves ‘Britbrats’, they were children of British military personnel who lived here in Singapore during the 1950’s and 1960’s. Most are around my age. Although I have often seen them in Serangoon Gardens, which was nearby to my kampong in Lorong Chuan, I knew very little about them. I believe very few Singaporeans, especially those of the present generation, know much about their lives. Surprisingly, many of them have fond memories of Singapore. Recently, I came across a website, known as Memories of Singapore hosted by a gentleman by the name of Tom O’brien. (Coincidentally, Tom, like me, was also born in 1952). At this website, they exchanged stories of their time in Singapore. For example, there was an interesting discussion about a smelly fruit called the durian. 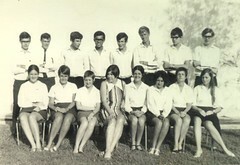 They also shared photographs and other memorabilia of their school days back in 50’s and 60’s. There are also many links to other similar websites. I approached Tom and he kindly gave me permission to use his photographs in Good Morning Yesterday. With the help of these photographs, I hope to start a series of blogs soon, entitled Places I Remember (inspired by the Beatles Song of the same title; an idea stolen from my friend Toycon, a twenty-something yuppie who enjoys old songs). I also thought that it would be wonderful if Tom and his friends could share some of their stories with readers of GMY. I believe they can offer a unique perspective of life here which even Singaporeans of my generation are not able to. I am happy to inform you that 3 of them, John Harper, Lynn Copping and Tony Boyle have agreed to do so. For a start, let me ask you. Do you know which schools they went too? As far as I could tell, most of them went to schools operated by the British Forces Education Services which was later called Service Children Education (link). One of these was the Bourne School (known earlier as Alexandra Grammar and Alexandra Secondary Modern School??) located at the Gillman Camp which I blogged about early this year. 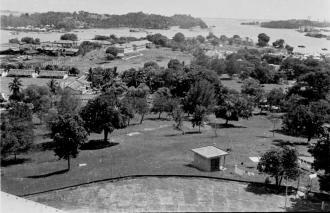 At that time, it was known as Gillman Barracks. Another was the St John Comprehensive School in Dover Road – presently occupied by the United World College. 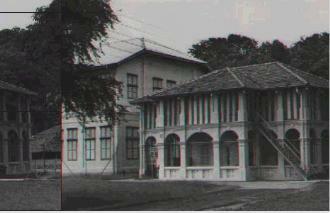 A third was the Changi Grammar School. Do the names confuse you (And I thought only our 'gahmen' likes to keep changing names)? Never mind, I am sure our British friends will clarify later. The above photos are of the Bourne School located in Gillman Camp. I am so happy to be finally able to show you a photo of the Gillman Pool. My thanks to Tom O’brien and Maurice Hann, a former teacher at Bourne School for sharing these photos. Thanks to the marvel of the internet, today we have a chance to bridge a cultural divide between Singaporeans and Britons of my generation; something which close physical proximity could not all those long years ago. Thanks also to the marvel of the internet, we can go back to the past and learn something new about what Singapore was like one generation ago, whilst our counterparts in the UK can find out what the Singapore they knew one generation ago is like today. As you probably know, the Chinese recently celebrated the Dragon Boat Festival, also call Dumpling Festival or Duan Wu Jie (端午节), on May 31st. This is the time of the year for bak changs or rice dumplings. Although nobody in our family knows how to make ‘bak changs’, nevertheless, we had a feast this year, thanks to my generous neighbours. The smell of freshly-steamed bak changs never fails to remind me of the time when my mum used to prepare them in our kampong home. Nowadays, kids can eat dumplings all year round. But when we were kids, we could only do that during Duan Wu Jie. For the benefit of our UK friends who might have forgotten what the rice dumpling looks like, here is a photo. The one on the left is wrapped in traditional bamboo leaves. 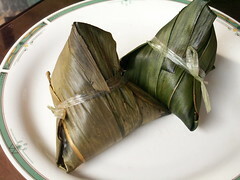 The other is wrapped in pandan leaves - it is called a Nyonya chang (dumpling). Of course you can tell that this is a 'modern' version because of the rafia strings. I am not going to explain the history of this festival because our kids probably learned that in school already. You can also read about it here. I just want to share a bit about how we did it in the old days. I think the method and materials have not changed. What was probably different was the equipment. My mum used to boil the dumplings in a stove using wood-fire. As such, this was done outdoors, usually beside our well. Instead of a pot, she used a big kerosene tin. We used to love watching her wrap the dumplings and tying them to a bamboo pole in clusters. I did try my hand once at wrapping the bak changs but it was a disaster. 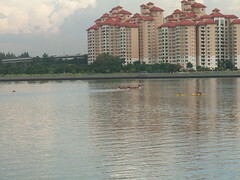 This is also the time of the year for dragon boat races. I learnt that this sport is now popular not only in countries where there are Chinese communities, but even in non-Chinese countries like Russia. 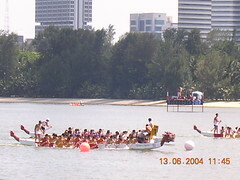 For example, did you know that even some states in the US have their own dragon boat associations? 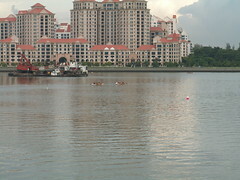 It conjunction with Duan Wu Jie, the SDBA (Singapore Dragon Boat Association)will be organising the 6th National School's Dragon Boat Championships at the Bedok Reservoir on Saturday, 17 June. For the past few weeks, my son and his team-mates at ACSI have been busy training for this event at the Kallang Sea Sports Centre. Whenever, I go to fetch him in the evening, I see many Caucasian expatriates training too. They are probably training for the senior category as well as international event which will be held on 1st and 2nd July. Details can be found at the SDBA website. Shutterbugs shouldn't miss this opportunity to catch some action and drama. Below are 2 video clips that I took of the ACSI teams in action at last year’s event. The first is a 24-men C division event and the 2nd is a 12-men B division event. “I encourage you to take the time to record the memorable moments you enjoy with your children. If you don’t have time to take elaborate notes or if you don’t have access to a VCR recorder, keep a diary, record an audio tape, and by all means maintain a photo album. My regular reader Fuzzoo must be thinking the same thing. She has gone one step further, in fact. She set up a blog called Road to PSLE to capture memories of her 3 darling daughters. Dr Dobson also narrated a funny incident involving the innocent and yet often hilarious remarks that children sometimes make. His story reminds me of an old black-and-white TV series called Kids Say the Darndest Things hosted by Art Linkletter. Do you remember this really funny show? I believe about 10 years ago, Bill Cosby resurrected this programme. In fact our own MediaCorp also tried to do a similar programme. 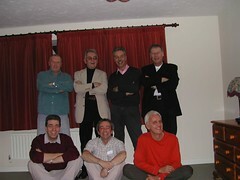 It was hosted by Andrew Lim who played Paul in the Under One Roof sitcom. Unfortunately, our version simply was not as funny as the Americans’ – it fact it wasn’t funny at all; and the programme was stopped after a short run. I too have a funny kids-say-the-darndest-thing story to share with you. To spend when you get to tomorrow"
I am not very sure what wedding dinners are like these days because I have not been ‘summoned’ for a long time. Most of the wedding banquets I attend these days are buffets held in our church compound on Saturdays. Prior to these, the wedding dinners I attended were usually held in hotels. Back in our kampong days, the traditional (Chinese) wedding banquet was made up of two separate sessions; one in the afternoon for women folk, and the other at night for the men. I do not know the reason for this segregation of the sexes. The banquets were usually held under canvass canopy in front of the groom’s house. The afternoon sessions tended to be noisy affairs because most mothers would bring along their children. I myself remember attending one such banquet with my mum. As there were no seating arrangement for children, the kids would stand behind their mothers. When food was served, mothers would busily feed themselves, and pass food to their children at the same time. You can be sure that no food would be wasted as any left-overs would be speedily 'ta-powed'. Sin Leong Restaurant and Fountain Night Club used to be here. During the kampong days, many of the marriages were arranged marriages between the kampong folks themselves. Usually there would an elderly lady match-maker trying to pair off suitable couples with approval from their respective parents, highlighting the individual's good points. She would get a big ang pow if the marriage went through. If the marriage 'misfired', she would get bad publicity which she would brush off, putting blames on everyone except herself. If marriages turned successful, she would proudly proclaim to the whole world of her professional expertise. The success rate of kampong-styled arranged marriages were unusually high and divorces were very rare; and widows seldom remarried. Perhaps Chinese traditions were still strong and prevailing at that time. One of the reasons for this success rate could be attributed to the fact that couples usually did not have a high expectations. As long as the husband had a job and look after the family, the wife would be satisfied. As long as the wife carried out her household duties and looked after the children well, the husband would be happy. Simplicity was a way of life then until the advent of HDB. Though there has been serious attempts by the Housing Board to re-create kampong life in the HDB heartlands, there has been little result success. 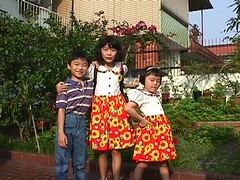 The first wedding banquet in our family was not held at home. 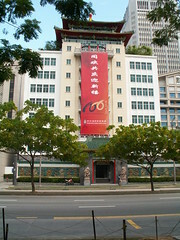 When my eldest brother got married, my father specially booked the hall at the Singapore Chinese Chamber of Commerce along Hill Street. My dad was a member of the China Society. He threw a huge banquet and invited many folks, including the member of parliament of Serangoon Gardens, Mr Roderigo who knew my father who as a long time member of the Citizens’ Consultative Committee. 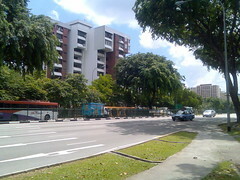 Incidentally, my eldest sister-in-law was also from a kampong: the nearby Plantation Avenue; also off Lorong Chuan. No, it wasn't an arranged marriage. They met at a .......... you guessed it; a wedding party of a mutual relative. I understand there were very few brides that came from the city. I suppose the city girls would not interested in us ‘swaku’ kampong boys.